in the city's oldest prep grid rivalry. 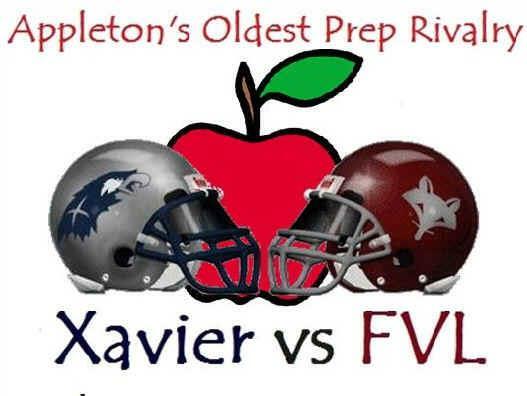 The Apple Bowl is the annual rivalry between the football teams from Xavier and Fox Valley Lutheran. It also is the oldest prep football rivalry in the City of Appleton. Back in 1987, when Don Dineen of Xavier plus Gene Strusz of FVL were the head football coach at each school, plus Xavier AD Jim Meyers, they came up with the novel idea and name of 'Apple Bowl' for the series -- which started back in 1960. The winner gets to keep -- for one year -- the prestigious trophy, which has a huge, golden apple on the top of the award. The score from each game in the series may be found on the trophy, which is presented at mid-field immediately following the game. After the game, the teams immediately line up along each 40-yard line... before handshakes... for the trophy presentation. The special, unique trophy is named the Paustian-Lloyd award... in honor of two veteran sports personalities from Appleton. The late John L. Paustian was a lone-time sports editor of The Post-Crescent, while the late Bob Lloyd was a long-time radio announcer at stations, mostly WHBY in Appleton. Both were very instrumental in providing tons of local media coverage, for many years, of Fox Valley area prep sports teams. When the game is played at Xavier, traditionally a large, red apple has been painted on the grass at the 50-yard line to commemorate the special history of the Apple Bowl game. And, of course, the winner claims bragging rights in the series, which is the oldest high school grid rivalry in the city. The prestigious trophy has a huge, golden apple on the top of the award. The apple was ordered from a trophy supply house in, where else, of course, the Big Apple -- New York. The score of each game in the series is listed on the distinctive, mostly-gold trophy. The 2014 game was the final meeting between the two schools in the Eastern Valley Conference, as the WIAA mandated that Xavier move to the Bay Conference after the 2014-15 school year -- marking the END OF AN ERA. Since then, they meet in a non-conference game. You can always find this page via a link on the FOOTBALL page of this web site.